Corporations are legal entities with rights. Also, people think they are evil, and not-people, so they shouldn’t have rights. I’m not entirely certain if those are the right reasons. I mean, Lex Luthor is kinda evil, but he should still have rights. The Joker is evil and crazy, and he still has rights, at least if you are Batman. Freddy might not have rights, but he’s dead, or maybe not real. Maybe things that aren’t real don’t really need rights. Corporations do exist, but they don’t exist. There’s no such thing. 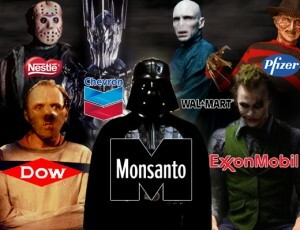 Corporations are made up of people. Chances are, you or someone you love works for a corporation…and there’s a strong chance you or someone you love hates the job they have working for this corporation. We hate getting spammy phone calls, and the person making them hates making them…but you got to pay the bills somehow. You’re not even a person making the calls…you’re just an extension of the Corp.
It’s a shuffling of responsibility. The Corporation has to pay a fine. That doesn’t make sense. The Corporation doesn’t make money, really. At least, that money is not realized until it transfers to the hands of people (either in the corp in question, or another one). The CEO isn’t legally responsible. The person who made the decision probably isn’t legally responsible. The Corporation is. Fines therefore hurt the people working for the corporation, and the people with power to do Evil Corporate Things probably have the power to have the consequences not effect them at all. Corporations may be evil, but if they are, it’s really just humans making poor decisions, usually to pad their own wallet. You do it too, I bet. You’re not entirely honest 100% of the time. Neither is Mr. Manager or Mr. CEO…given a chance to get some extra cash, sooner or later, they’ll probably take it. When the responsibility is shifted off of them, and to a non-entity, it encourages that behaviour. The solution? Stop being evil, clearly. Move away from thinking about corporations, and remember, they are just people. Just like this guy. Doesn’t he make you happy? Corporations can have a purpose. The sole purpose should not be to maximize profits. If that’s the charter, it will end poorly, 100% of the time. If the purpose is to develop X widget for the good of humanity, a corporation can do great things. If we look to the unimportant things (that don’t even make us happy), we’ll continue doing unimportant things and not being happy. If we focus on maximizing good for people in general…we’d have a lot more interesting things going on. This isn’t anti-captilism, or anti-corporation, really. It’s just that we are doing it wrong. If you have the wrong goals, how can you expect to end up right? 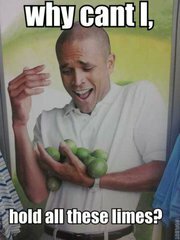 Silly limes. Get a basket.